Eva's school librarian told her that second graders check out the most books from the library. They are allowed to check out 7 books a week! Eva takes full advantage of it. She has her nose in a book pretty much from the time she wakes up to the time we turn off her light at night. It has been interesting to watch her book choices. I'm happy to report that there does seem to be life after Rainbow Magic books! 1) Because of Winn Dixie - I LOVE this book. I read it to my second graders when I was a teacher and fell in love with it then. Eva and I recently watched the movie and it was S.L.O.W. The happy ending made up for it, though. 2) The Miraculous Journey of Edward Tulane - This was recommended by a friend and it was as beautiful and poignant as it was promised to be. Eva enjoyed it but missed the deeper layers. This is a beautiful book. I will definitely re-read it. And the exciting news (for me at least) is that I think Audrey is ready to listen to the Little House on the Prairie books. I've been reading Rainbow Magic books to her and she is now able to sit/listen/stay interested for a chapter or 2. As soon as Bryce is done reading Harry Potter 2 to Eva the three of us girls will start Little House. I hope they love it like I did! You know I love to talk about children's books so please tell us what are your kiddos reading these days? So happy to see a post! I have been reading Julia the Little House books! She would prefer the faerie books (Amy the Amethyst faerie, etc. )so her Dad reads those to her (Ha Ha). She and I are half way through Little House on the Prairie. She then reads a Bob book to us. She is doing pretty well and is feeling more confident with reading. I don't remember reading the LIttle House books when I was young. I am enjoying them. Jacob likes Ivy and Bean, Beverly Cleary, A to Z Mysteries, Geronimo Stilton series (as well as Thea Stilton, etc). He has been reading the Hardy Boys to Keith. He is like Eva- always has his nose in a book. Sometimes I want to take them away from him to get him to do something else but I just can bring myself to punish a book reader. It just seems counterintuitive. Well, you know I have boys, so there interest seems to be different from girls. However, Stink was very popular here in our house along with the Diary of the Whimpy Kid series. When my boys were her age they love the Magic Tree house series and How to Train Your Drtagon. My son the 4th grader read because of Winn Dixie this year for his book club at school along with A Wrinkle in Time and Old Yeller. LOVE LOVE the Little House series. My barbi's were all characters from Little House!! FIrst, thanks for the comment. Second, I didn't know you are/were a teacher! Your post makes me feel guilty. We have been lax on the reading aloud, even though we know the benefits, esp. in English for my bilingual child. The only book we are reading to her is The History of the World, and it's been slow. She does love it, though. It's been complicated bc she can't read as well in English so many of the titles you mentioned that your daughter is reading are not accessible to her in English...and I know better than to read Junie B. to her. Maybe you've given me the inspiratin to try a novel...I'm bringing a copy of BC of WD home! 7 books? I am so jealous. Will just gets too and, guaranteed, he's already finished one on the drive home from school. Though they seem to be more popular with boys, Eva might like the Wimpy Kid books. (I just loaned one to a Year 3 girl, so you never know.) Will's really into Percy Jackson these days, but I don't know if Eva would like that. Narnia maybe? I am sure you and I could talk books all day long. Tom just finished reading Harry Potter 3 to the girls. Madison got impatient waiting and read 4, 5, 6 and is currently fininshing 7. All in about 2 months time with many other books thrown in. I am having a hard time choosing a new read-aloud to start with them. 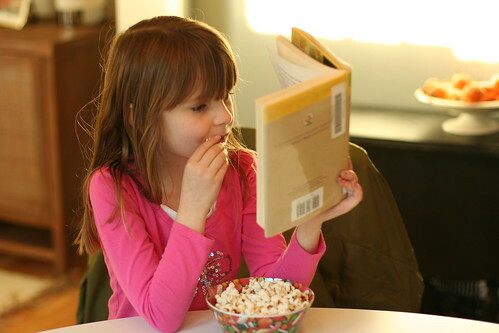 Nora's independent reading is finally clicking in and it is fun to see her reading on her ownmore each day. Have to say we were excited to get the newest Kevin Henkes book and all three of us were greatly disappointed. We have read a lot of those as well and are going to start Harry Potter soon. We are (my 7.5 year old daughter and I) currently on book 4 of the Emily Windsnap series about a girl who is half mermaid half human. They are actually really good and my daughter is loving them. We are headed to see the Arietty movie this weekend after I read The Borrowers to my class earlier this year. Glad to hear it is good. Thanks for the book recommendations. Susan - Just the other day Eva said she wanted to read a Nancy Drew. She said she heard they were mysteries which are her fav genre. Not sure they are age appropriate, though. LikesChocolate - Eva has mentioned Diary of a Wimpy Kid. A Wrinkle in Time is one of my favorite books! WasSoggy - Who doesn't love Little House?!? It is timeless! Dana - Guilt is garbage!! Your daughter is bilingual, HELLO! That is wonderful! I've heard about the G Stilton books, maybe I'll suggest them to Eva. BC of WD is amazing!! Em - I love her too! Jennifer - I think she'd like the Wimpy kid books too. She's mentioned that a girl in her class reads them. Lisa - I haven't asked Bryce his plan for the HP books. Not sure how many he is planning on reading to her. Don't they get a bit adult? I only read the first one. Too bad about the Kevin Henkes book. I was disappointed in Birds - I think it is relatively new. Leah - I just requested a few of the Emily Windsnap books from the library. They look great. Thanks for the rec.